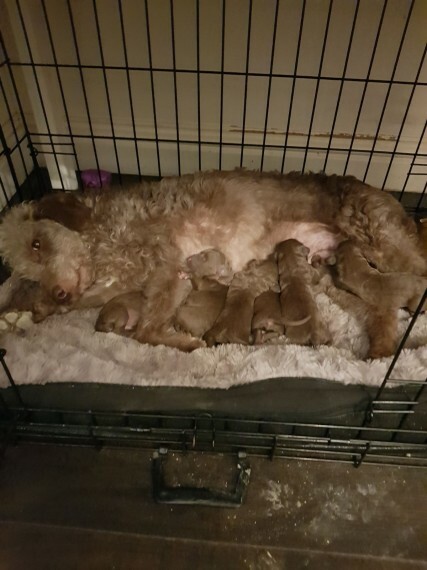 Liver litter of Bedlingtons both parents liver mother is our family pet and is a beautiful dog we have 3 boys 3 girls we have 3 boys for sale 1 girl. Brought up in family environment the puppies will be vet checked, microchipped, flea, wormed and with certificates before they leave there mother wanting there forever homes. Can send photos of parents both kc registered and can be viewed and sercured with non refundable 100 deposit. Photos will be updated soon. Adopting, or buying a new puppy or dog is an important decision and big responsibility. As an owner, you will solely responsible for the welfare of your new pet and will also be financially committed. Before you decide to buy or adopt you must ensure that you’re 100% committed beforehand. For further information on caring for puppies and dogs, please visit our pet advice section. You can also find out more information about the Bedlington Terrier breed by visiting the Bedlington Terrier Dog Breed Information.